Germack hosted my wedding last weekend and the level of service and the food were amazing! Anything that I or my guests wanted it was done promptly. Pros: The venue is so beautiful with a lawnside ceremony area that has a Greek structure. I found the pictures on Facebook. Cons: There are no cons. Everything was amazing. I highly recommend. Their management and customer service at this location is appalling. Get everything in writing when signing up or cancelling at this studio. They lie and deceive you when cancelling. I've ..
Pros: You get a great workout. Cons: Management is horrible, they trick people into staying and over charging during membership. The Pizza is awesome but the sandwiches are really the highlight. They're piled high with the perfect ratio of meat, cheese and vegetables. America's Largest backyard party! Great place to hear live music on a night out! Unlimited mimosas or bloody mary's during brunch for only $12 with the purchase of an entree! Fun place to spend a Friday or Saturday night too! Tassi Organics and More llc. Are you looking for a taste of the old west minus the snow and cold temperatures? Davie, Florida might just be the town for you. Davie is close to Miami and Hollywood but you might as well be miles away, the only signs that you're in South Florida being the warm tropical breezes, palm trees, and tropical floral plants. Gorgeous weather graces Davie year round with highs in the mid-seventies during winter and lows averaging around sixty. Seventies are the low in the summer and highs usually range in the upper eighties to lower nineties. Nature parks are numerous within Davie if one is craving the outdoors along with a ton of trails for horses and walking alike. The local McDonald's, placed in the old west designed downtown, has hitching post outside where riders can come in, hitch their horses to the post and sit to enjoy a modern favorite: burgers and fries for a cheap price before heading back out on the trails. Higher education is well received in Davie and an added bonus to living here is that this town, being the home of Nova Southern University, is where the Dolphins use the university field for practice. 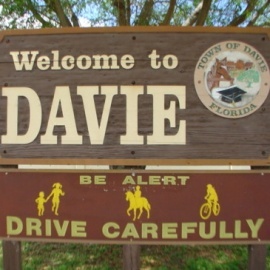 If you're a Dolphins Fan, an equestrian enthusiast, or you a combination of western charm along with the warm ocean breezes, Davie is the town for you. If you're looking to line-dance the night away, look no further because we've compiled a list of the best country bars in Fort Lauderdale so you can channel your inner cowboy or cowgirl! Helps prepare expectant dads for the responsibilities of fathering. Explore the museum after dark and be immersed in a unique, artistic experience combining live music, performance and installation art, culinary delights and creative cocktails. The Davie Jazz Festival with a Western Flare, in it’s inaugural year will celebrate various music genres and performers by local high schools and national artists on the Bergeron Rodeo Grounds. Join R.O.Y.A.L.T.Y. Inc. Mentoring Program for our 2nd Annual Mother/ Daughter Mother's Day Brunch. Kids and Teens are invited to sell their art at YAA's 30th Birthday Bash featuring the 2019 Festival of the Arts! Every year, the Young At Art Museum hosts an art fair and art showcase where kids can compete and show off their various artistic talents.